One thing my mom always had on display every Christmas without fail, was her snow village. The family would all join forces, and meet up at her place one evening. My brother would generally dig into the crawl space for her special holiday treasures, then unearth box after box, with everyone getting to work. But without a doubt, the snow village had the most boxes. 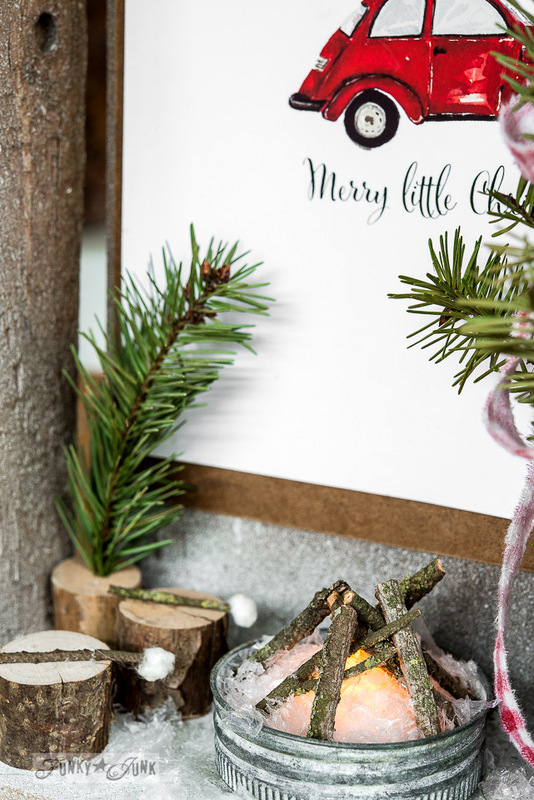 Every year, we’d carefully unwrap each precious little cottage to create a dreamy little winterscape on mom’s stereo cabinet. Mom loved the snow village. But when she passed on, I was tempted to take it. But… I had no room. That village was quite an impressive collection! And perhaps that’s why I was never drawn to collect my own. I simply didn’t have enough flat surface avail. 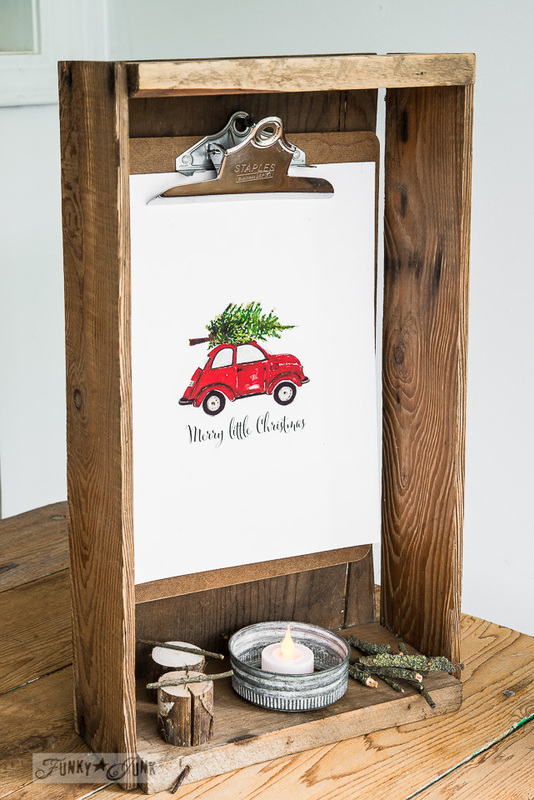 So when I became the proud owner of this sweet originally hand painted print of a red VW bug carrying a Christmas tree by Craftberry Bush, (isn’t it darling?!) I knew I had to do something special with it. And then it hit me. I was about to land my first ever Christmas village… or rather, crate shadow box snow scene! My style. I rummaged through my stash for the perfect crate. The picture was clipped to a clipboard, then held in place with a screw. Perfect fit, with room to play down below. An outdoor picture you love (you can find the red bug HERE) on a clipboard. 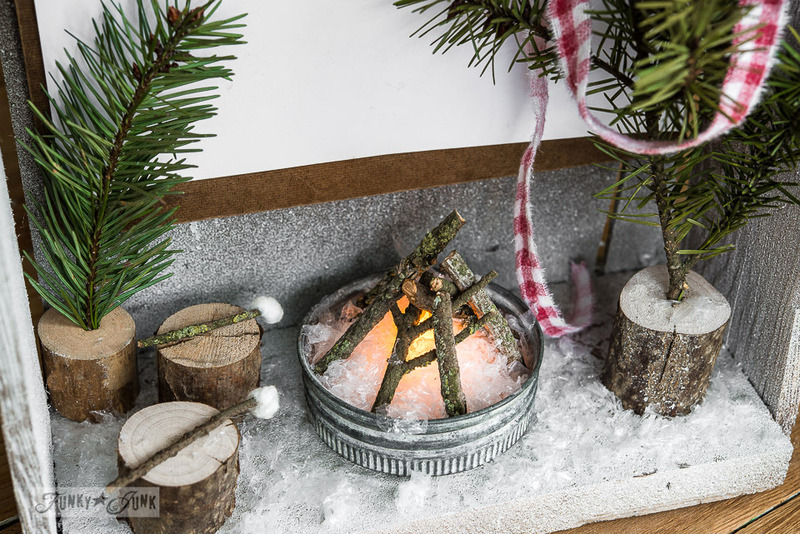 Fire pit / mason jar lid, battery operated tea light, faux snow and sticks. Benches / 2 branch cuts. 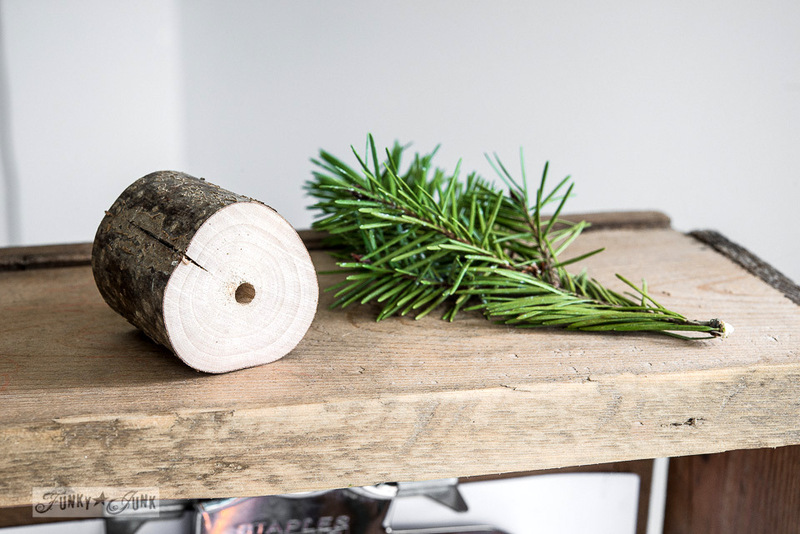 Trees / 2 branch cuts with evergreen sprigs. Marshmallow roasting / branches and q-tip fuzz. Small holes were drilled into branch cuts for the trees. All set up for the winter marshmallow roast. The little tea light flickering under the plastic snow is the cutest thing! Cute! But this didn’t feel snowy enough for what I desired. 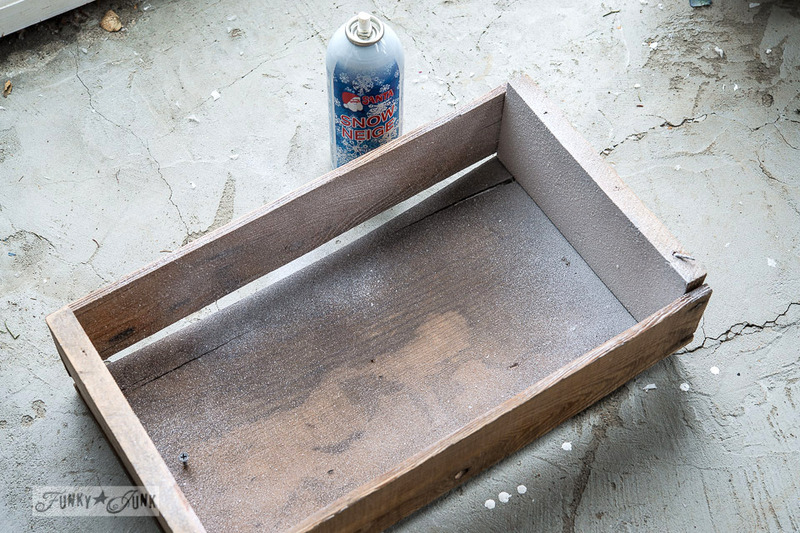 The crate was waxed with Miss Mustard Seed’s Furniture Wax (so it would be easy to clean), allowed to cure, then sprayed with spray snow. Heavy on the bottom, graduating to lighter towards the top. I allowed the snow to completely dry before setting it up. Then everything was set into place. 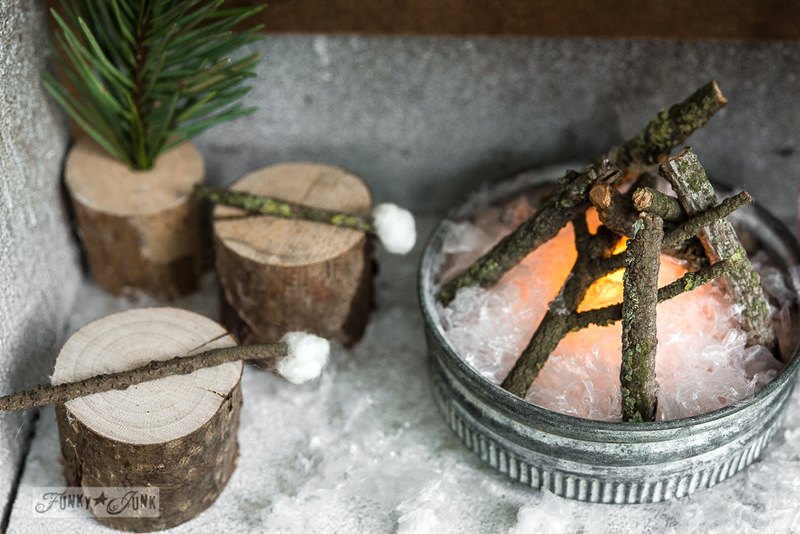 A battery operated tealight was placed inside the mason jar rim, plastic snow topping it to hide the tea light, then firewood. Then the rest just fell into place. A little scrap piece of gingham fabric was torn and hung from the tree, garland / scarf style. So cute! Easiest picture frame in the world! My vintage clipboards were too long, so a new one won this round. We use to gather around the big ‘ol firepit on the farm growing up. During summer, the entire family would venture over every Sunday and we’d sit on our huge front yard (dandelion filled field really) and gather around for a massive wiener roast. There is nothing like sitting around a fire. Don’t you think it conjures up conversation like nothing else? The fire pit really does give off the cutest little flickering glow under the snow! 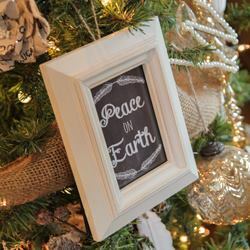 This little cutie can be hung on a wall, or left on a window sill or shelf of choice. Especially cute in a dark corner with the fire pit flickering away! This little snow scene is nowhere near as grand as my mom’s village, but I’m sure she’d be happy to know all the memories my version brings up. What would your own little memory filled shadow box crate look like? Today’s giveaway offers you a very unique shopping experience you are going to LOVE! Edited to add: This giveaway is now over. Meet Lucy, of Craftberry Bush! I’ve known Lucy for a long time. And at long last, we finally got to meet during my Toronto trip to Blogpodium. And I was so thrilled to learn she’s every bit as amazing in person as she is online. Her heart is so beautiful, and anyone that has a chance to run into this girl is blessed indeed. Lucy has many talents. 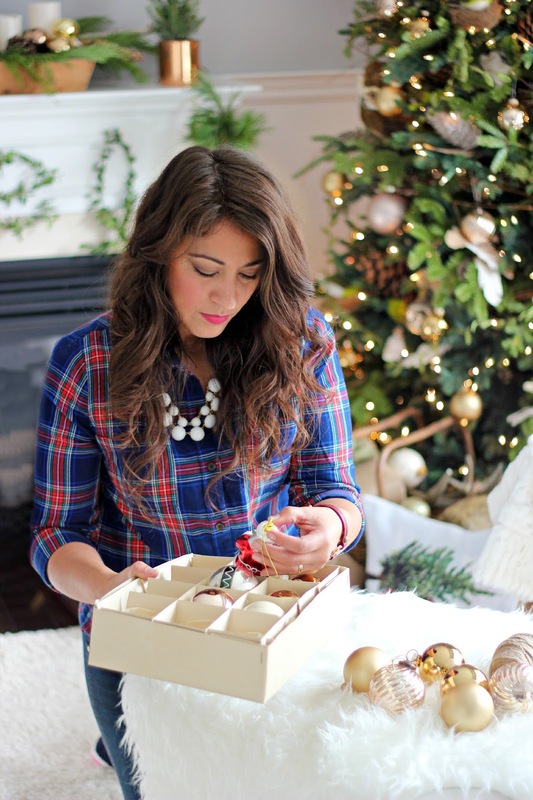 Her Christmas home tour and photography will leave you spellbound! But she does something extra special. But she has an extra special way she shares her love of art. Basically put, you can pick one of Lucy’s hand painted designs, then choose what you’d like it to go on! From prints, totes, pillows, iPhone cases, wallpaper, rugs, mugs, and so much more! 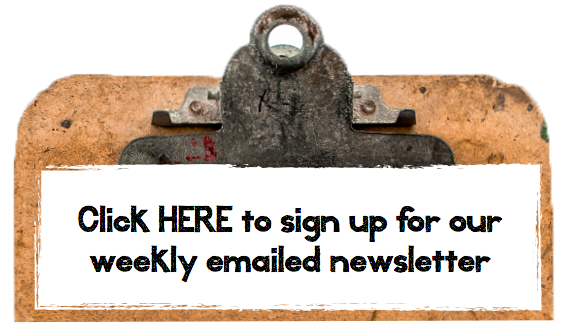 Today, Lucy has generously offered a lucky reader a $100 shopping spree from her store! Looooook at all the things ‘my little red car’ can go on! But I will admit, I love the print so I can do lots of things with it myself! Giveaway will be randomly drawn on Dec 18th, midnight EST. The winner will be published on this post, so please check back. Winner will also be emailed and given one week to respond with full shipping address. You must be over the age of 18 to enter and have a valid email. Offer good in the USA and Canada. Void where prohibited. Disclosure / I was not compensated for this post. Lucy generously offered her talented gifts for you to enjoy! Thank-you, Lucy! Good luck! And be sure to return for tomorrow… it’s gonna be a gutsy, scary and exciting COOL ONE many of you have waited a long looong time for. Cya then! 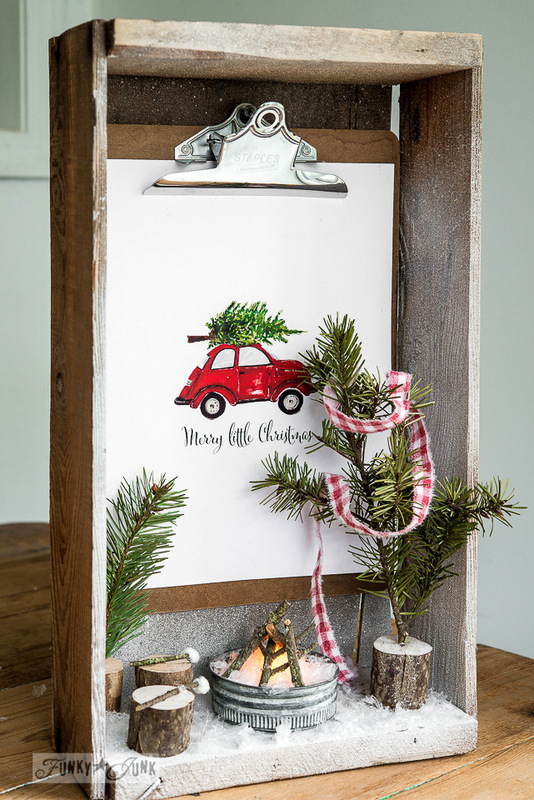 Am familiar with Lucy’s work and LOVE the shadow box you’ve created with her little red car print. Currently that is my favorite drawing which I would love to have and just frame up on a wall somewhere where I could see it every day! It makes me happy! I love all the prints, but my all time favorite is the red car and Christmas tree! It’s so cute! LOVE everything but the art prints to frame would be my first purchase. love, love, love your crate shadow box! I wish I had room here to create one too! My favorite over at Craftberrybush is the Red Christmas Beetle. I would love to start my winter mornings with my coffee in such a happy mug! I love the ball jar picture. I would love the tote bag! I covet Lucy’s pictures everyday! I adore the deer prints and all of the small paintings she is so talented! I love the Red Christmas Beetle pillow. Love your blog. Thank you for the giveaway. 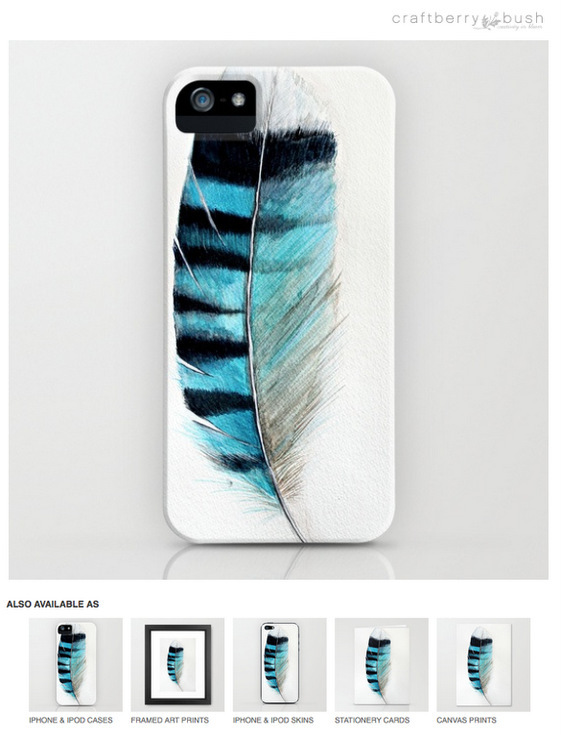 I would order the Blue Jay feather on an iPhone case and the Feather Set on a wall clock.They’re all beautiful! I love the “Winter Finch”, it reminds me of my parents who have both passed on. Dad loved to watch the little finchs out his back window and Mom’s favorite time of the year was Christmas, so the Noel and bird both spoke to me. I love all her pieces, the simplicity and the subject matter. So hard to choose! I think it would have to be the Noel Wren on the pillow. Her style is just adorable! I’m in love the with the feather collection. That in a pillow would look perfect on our gray couch! I can’t decide between the red car and “let us adore Him”. Either way I’d frame it. I love the little red car print. I’d frame it and put it in my kitchen so I would see it often. I might even get a tote bag with the print on it. I would love the deer with the scarf on a pillow. Also the red beetle on a pillow. Picking a favorite design from the Craftberry Bush shop was a difficult task. There are so many designs that I like, but I kept going back to the oak leaves. I would order it on the tote bag, especially since I discovered that the design is on both sides! I’ll have to point out the Pear to my sister-in-law whose last name is Parrish. She likes things that are “Pear-ish”. Wow! love them all 🙂 but the deer and the mason jar are my faves…probably would just order the print and frame (or tape) 🙂 thanks! I just adore the reindeer watercolor. It would be so perfect on a tote! I personally love the Deer Buck with Winter Scarf and the Red Christmas Beetle and would get the print on a pillow! Too many awsome designs to choose just one! However,;I do love the Deer buck with winter scarf~watercolor design. So much so I ordered myself a tshirt! Our home is tucked away surrounded by woods so we love our deer visitors! I would order some pillows for our family room if I were the lucky recipient! I just love the designs by Craftberry Bush! My favorite is the red VW because it was my first car and I still love them. I wish I had one now! The tree and the falalalalalalalala around the coffee cup is so adorable!! I think I would have to go with the print though since I have so many coffee cups! Thank you for giving us this opportunity to win something and for the chance to see her beautiful art work!! I would get a print of the buck with a scarf. It is my favorite. I love so many of her designs…since it is Christmas time I think I would like the Christmas Beetle in a pillow. But for everyday I love the buck pillow and the do what you love pillow…..Oh so many choices! Thanks for the opportunity! karen…. I love Lucy’s store and her designs. The one design I think would be ideal for me is the deer on the T shirt. There’s something incredibly friendly about that sweet little face. I need the deer pillow cover. I have coveted him ever since I saw him!!! I think I’d get the snowy owl watercolor on a t-shirt. She is so gracious and so talented! I’m in love with Craftberry Bush! I ordered the VW Bug print on a pillow. I loved it so much I just bought another pillow! This time, it’s the deer with scarf. I can’t wait to get it! Thanks for the opportunity. I’d order “Oh come let us adore Him” on a tee. After all…Jesus is the reason for the season! The red vs pillow of course! Following funky junk on Instagram…pgboszko! I love Craftberry Bush! Thanks for sharing her with us! 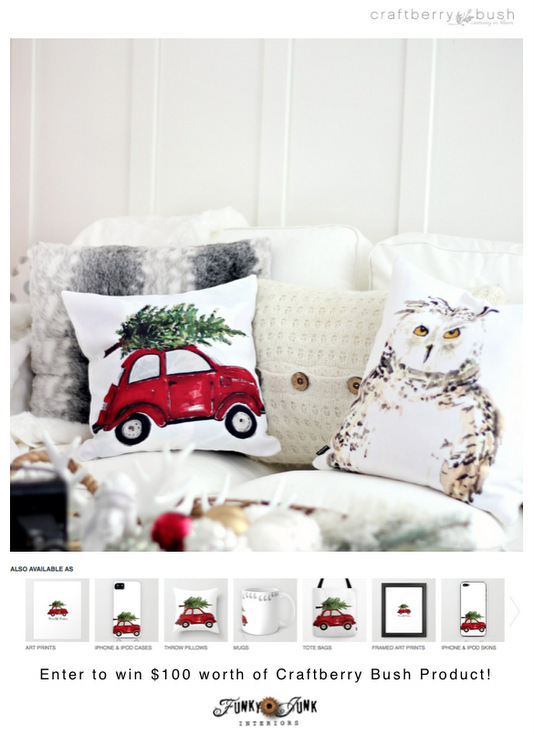 I’m with you on the red VW and Christmas tree print and pillow…Perfect! My first car was a VW Beetle Convertible. I loved driving around with the top down during the winter, especially when snow was falling. People looked at us like we were crazy. Of course, we were, but we had so much fun! i love her blog and am amazed at her artwork. everything is gorgeous, but i would choose the blue feather pillow or the watercolor polar bear. wow! thanks so much. I am in love with the Red Beetle. The Pillow, the print, the phone case. I can’t get enough of this Red Beetle. 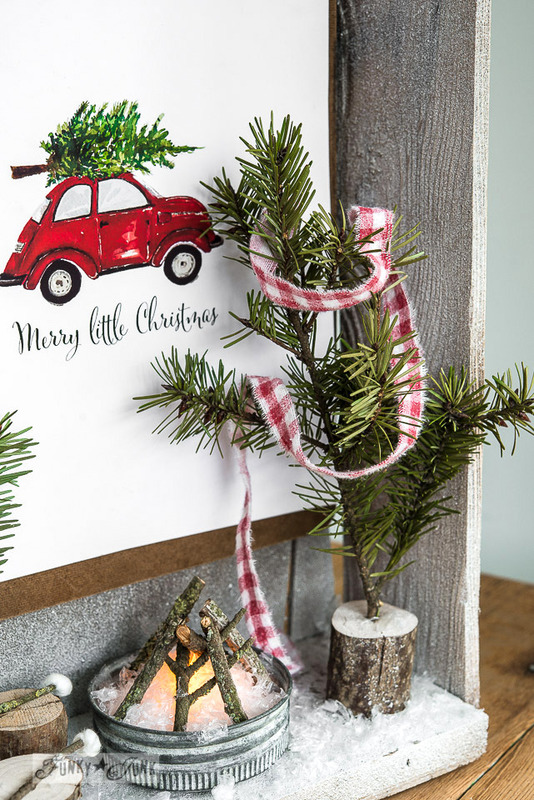 I would love to have that red VW bug with Christmas tree on Vector – it would look fabulous over my mantel. Thanks for the awesome offer. Wow! All her items are so beautiful, but I think I would have to go with some throw pillow covers… I particularly like the ball jar with poppies. I WOULD LOVE THE VW PRINT. THE SIMPLICITY OF IT REMINDS ME OF MY CHILDHOOD. IT IS DARLING! I love the cute little bug too. I wanted one when I was a teen and never got one. It would be so cute on a pillow. I adore that shadow box!!! I would probably find it hard to pick one item!!! I too love the little car (and the fact that she gave a free download of it on her blog a couple weeks ago) and would love love love to have it on a pillow because I know hers would be much lovelier than if I tried to make it with the download. Thanks to you and Lucy! I follow cranberry bush on Instagram. What a sweet little project! I love it!! I really love the little red bug. I think I would choose a cute Christmas pillow if I win. Or…I also know my future Daughter in law would love the mason jar print on, well anything!! Now the jar with the flowers or the lemon?? Oh my goodness so many choices!!!! I love the Easter Bunny and the Mason Jar with the Lemon….and the whale!!! I am in love with the reindeer with the scarf so cute. Thanks for sharing the link. Oh my gosh that is one of the cutest shadow box dioramas I’ve seen in ages Donna! 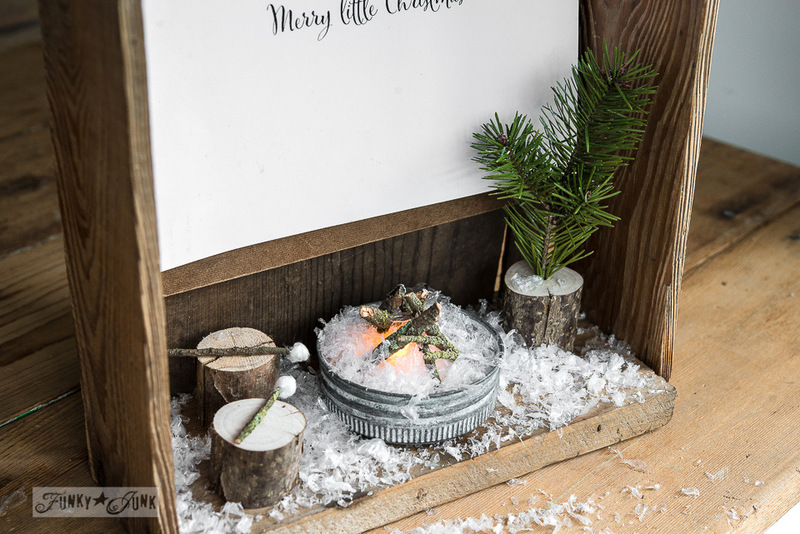 The snowy firepit and mini marshmellow sticks are so adorable. It conjures up memories of days spent in the country during the holidays ski dooing and warming up by the fire. Lucy is one talented artist! There are so many of her images that I love, the Deer Buck, Red Cardinal, Wren and the list goes on but my favorite for the holidays is definitely her Red Christmas Beetle! I love it as a throw pillow or art print. Thanks to you and Lucy for offering this Giveaway! I love the pink peonies in blue jar! I just renovated a bathroom and would order the shower curtain – the colors would match perfectly. I’m using my grandmother’s blue Ball jars in other places in the bathroom. I also really love the “do what you love” design on the t-shirts – that fits my daughter to a T (pun intended!). Thanks for offering such sweet giveaways Donna! Merry Christmas. . . . . . of the rusty, funky sort! I drove a beetle for over 20 years, I would love to win the “little red car” throw pillow. I love the simplicity of Lucy’s artwork, there is an incredible gentleness to it! I would order some of the prints, I have two frames on my stair case that have tired pictures in them and need something new and stimulating! Love Bless this Nest on an art print and Snowy Owl on a mug. 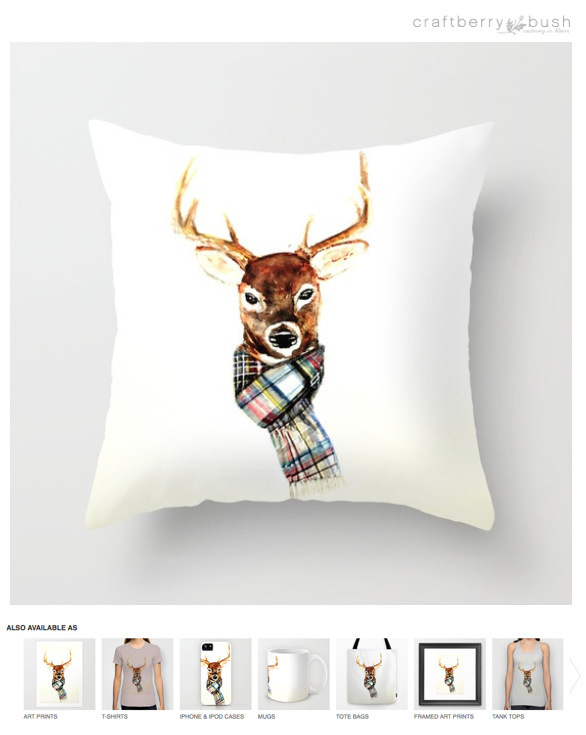 I love, love the Buck Watercolor Pillow. 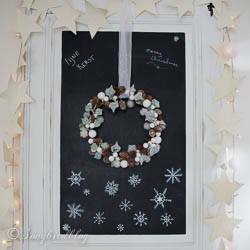 I’ve seen it on several blog sites and it looks great with Christmas decor. Thanks for the chance to win! I love the little red Beetle with the tree on a cushion. Your little snow scene is so sweet, and I loved the story that went with it. Thank you. 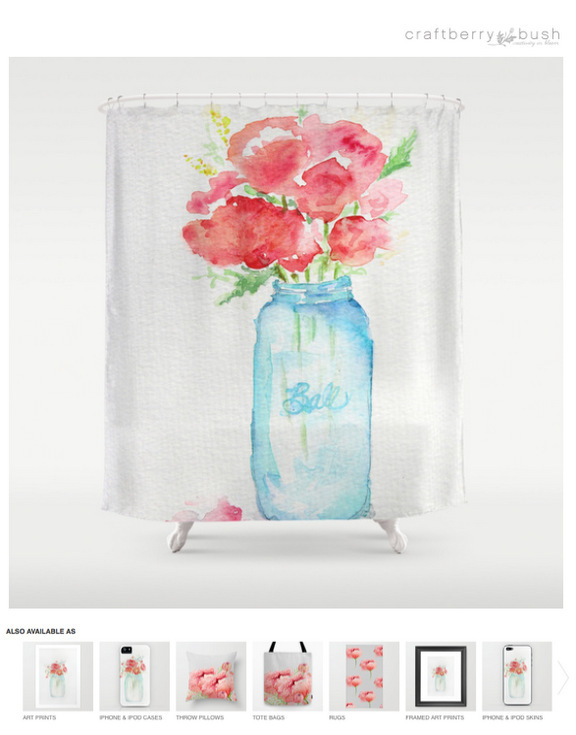 I would love to order a shower curtain but can’t decide which print I like the most.They are all so beautiful. I love love love the “red Christmas Beetle” and would order it on a pillow. I have followed all 3 on instagram and am happy to do so!! Love all your things (shadow box is adorable!) and I also have a snow village (so does my mom) that I have to try to find a place for every year! Been following you a long time! I love Craftberry Bush and already purchased the red beetle pillow (for me). Love your print & shadow box idea – genius! And I LOVE Craftberry Bush! Thanks for introducing us!! I am in love with the turquoise VW Beetle watercolor – perfect for my office! I am going to have to pick up a print or canvas of it & let it serve as my inspiration to FINALLY get my office reno finished over the holidays!! Also, love all the birds – might have to snag the cardinal print for my mom for Xmas. I would order the deer with a scarf pillow from Cranberry Bush. That is sooooo adorable. I love her blog and all of her paintings. I’d get the deer or the poppy on a pillow. 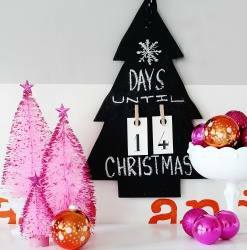 I am loving all the wonderful Christmas decorating ideas! I just recently bought my first pillow from craftberrybush. I would love to buy the red car one for my home! OMGosh, her work is amazing. I would have a hard time deciding which piece I would want but I think it would have to be the red beetle on a tote. My favorite is the Cardinal, which I would love to see on a throw pillow. The Cardinal is our state bird. I love to see them at my bird feeder in the winter when it is snowing. That pop of red among the snow is so beautiful. I love the red bug carrying the Xmas tree! I would order pillows, and I am totally torn between the buck, the fawn, and the red cardinal! All of Lucy’s work is so beautiful, and I love the vignette you made! I also started following you on Instagram. I love, love, love the red beetle print. I want it on a pillow and the print! I am following Funky Junk Interiors, Inspired by Charm and Craftberry Bush on Instagram! I like the Christmas Fawn and the floral antlers. Well I like more so not sure of my favorite. Probably in pillows. I would love one of the Iphone cases with either the feather or the cherry blossoms on it–I can’t decided yet! I love the Happy Dots Framed Print. It would look pretty in my newly remodeled bathroom! I follow you on instagram as kluckingbearstudio. Love that shadowbox! I’m following Craftberry Bush on IG (@amymaddux). I’m following Funky Junk on IG (@amymaddux). Love your website and your creativity. I just checked out Craftberry Bushs’ shop and all of her prints are adorable but my favorite one by far is the buck with the winter scarf! I’m following Inspired By Charm on IG (@amymaddux). I’d order the “RED BEETLE”…..I’d like it as a print..
Oh my how generous! I love the owl shower curtain. I have started collecting owls this last year. My parents passed and they had a yard ornament business called Owl Hoot. Owls make me smile and think of them. Of course there is so many other things I love. Thanks for the chance. The peonies in the ball jar and the VW are probably my favorites, but I also like the blue bug and the bird nests. I think I would get several of the smaller prints to spread the love around the house. (I also like the “Love” print…heart shaped! Man…so hard to choose just one! Thank you! I kid you not, I just bought that pillow. I would love to have it as a print. I would love the VW bug with Christmas Tree on top made in a pillow! Love this…oh there are lots of other items I would love but at this time of year the Red VW w/tree is my cup of tea..
thank you from the Coast of NC!! I love the buck and would put it on a canvas. I loved perusing the Cranberrybush site. There are so many wonderful creations. I love the red beetle you showcased in your blog today, but I am smitten with the Pink Reindeer. It is unusual in its content and color (not your common red and green) and could be used throught the winter season. 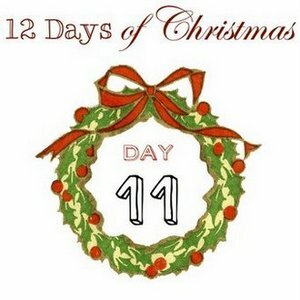 I must also comment on how wonderful your 12 Days of Christmas collections have been. I am blown away each day at how much I love each thing you’ve created. I’d say that you’ve outdone yourself this year!! Donna, I love your shadow box. I think Christmas is a time when we stop and reflect on our memories of past Christmases and loved ones who are no longer with us. I love the deer head and the Ball jar print, but I especially love the red beetle print. Oh my goodness. This is soo adorable! What a great artist she is. I’d love the red cardinal or deer buck with tie on a pillow. Love your shadow box. You gave me an idea to display my stirrups and spurs! I’d select the Snowy Owl watercolor by Craftberrybush on a pillow- my girlfriend in Regina loves Owlsher family room. I would love to have some of her tote bags. I follow FJI on IG. The seagull print would be perfection in my master bath! I follow everyone on Instagram, I am Southportmom! I love the red car and tree on a pillow. I have a vignette with a rusty truck and a tree in the back. Definitely a theme going. I love your snow scene a lot! The red Christmas VW and the owl on a tote or pillow! I would order the Christmas VW. I used to have a red bug. Now I have a green now. I don’t have instagram. Love the ball jar and pink flowers. The shower curtain is really cool. i am with everyone else. the red bug screams christmas. but i also love the cherry branch, the blue jay feather. who am i kidding, i love them all. get the same design in notecards for Christmas thank yous. Next would be something with the Blue Jay feather and the beautiful red cardinal. These designs just make me feel Happy! I love the Blue Jay Feather!! Love that color blue!! I want it on the IPhone case. I would get to enjoy it all the time! with a $100 gift card I would be selecting a whole couchful of bird / egg / and “bless this nest” pillows. thank you for introducing such a talented artist to us. I’d have to order the red bug – my first car was a red vw! On a pillow probably. LOVE the Christmas beetle!! I love the throw pillow for my favorite chair in our parlor and the tote bag to carry all our gifts to Gram’s house! I follow Craftberry Bush on IG. and I follow Inspired by Charm on IG. My favorite is the Do What You Love artwork. It’s antlers with pink flowers. I think I would like it best on a print. I love the red Christmas beatle. I love the Red Cardinal best !i want it on everything! Especially the canvas wall hanging and the pillows! I am now following Craftberry Bush on Instagram as gator1378 , thank you! Her work is all wonderful! I really love the bless this nest. I’m crazy about throw pillows, so I would like it on a pillow. Thank you! I am now following inspired by charm on Instagram now as gator1378 , thank you! I love the Cherry Blossom print and would probably choose that in a framed print….though I’m pretty sure I would agonize for hours before choosing! Absolutely adorable! 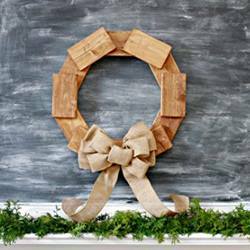 I may use this idea for some winter decorating in January! It is just too cute not to use! Hmmmm … this is one of those cases when I’d like to say: one of each, please. But I really, really like the Beetle with the tree on top. How cute! I’ll take it on a pillow. You guys are great! Thanks for the give away! I like the Sunday Afternoon on a pillow. I am in love with the pink peonies in the blue jar. I would love to have some of these. Actually already ordered two copies of the red bug for my daughter and I. Thought we would make your campfire setting. I love Lucy’s shop!! My favorite is the little red car and I would put it on a pillow! I just followed Craftberry Bush on Instagram. I am known as susiekr on Instagram. Love the red vw SO much!! O come let us adore him on a pillow. I love the red cardinal print! I have an old chest that is a little the worst for ware. Champness I think will breathe new life into it. Would love to try. I would pick the pear watercolor print because I just love pears and collect different media depicting them. There are so many lovely things to choose from …but her pear is just the best!thanks for the chance to win something! The Christmas tree beetle or the gray blue pumpkin I can’t decide. following craftberrybush on instagram as iamalighthouse! following funkyjunkinteriors on instagram as iamalighthouse! following inspiredbycharm on instagram as iamalighthouse! Your project is Absolutely Adorable!!! The VW bug painting is wonderful! How fun! I love the Blue Jay feather and would love it on canvas, but don’t hold me to that! There are so many beautiful designs that I could change my mind! Thank you for the opportunity to win! My favorites from Craftberry Bush are the nature prints. I’d have some put on pillows. I am sorely lacking in that area. Congrats Sherri, you are the WINNER! My favorite is the fawn with the wreath around her neck… in fact I just ordered the phone case for a phone I don’t even have yet! Weeee, so cute! I love the red cardinal and I’d order it on stationery for a friend who loves birds! Thanks for the chance. Seagull art print in conservation natural frame. All my favorite colors and beach related, too!!!! I like the car with the tree on top – like it on a pillow or tote best! 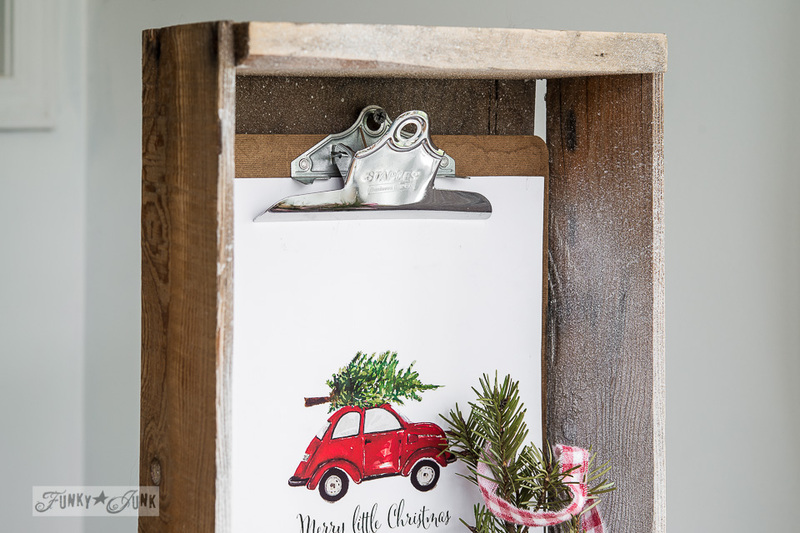 love the VW with the tree on top – on a pillow or tote! I love the “Nest” throw pillows and cherry blossom tote bags. How fun! I love her artwork!! 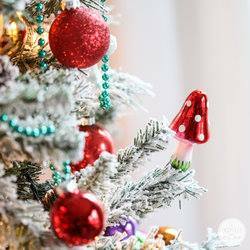 I would for sure get the adorable red bug with the tree in a print and also on canvas!! Amazing Talent!! I also adore the pumpkins!! I could spend a fortune!! Red Christmas Beetle! In a throw pillow! I love how the design covers the whole pillow! I ordered the red car with tree (on a pillow) last week; eagerly waiting for it to arrive! I LOVE your shadow box idea, may have to place my own version near the pillow. So happy I found Lucy, and your blog! I love the pillows….little red bug, deer with scarf and the sweet wren! Pick me! Love, love the deer with scarf pillow. Thanks for the giveaway. I’m absolutely in love with your snow crate!! Growing up, we used to set up something similar using the old wooden crates that mandarin oranges came in (almost 60 years ago I’d never heard of a clementine). Last weekend I ran into a dollar store and saw a crude little wooden stable that made me stop and pause, thinking of my Mom’s little crate. I thought to myself I’ve got to make one in memory of Mom (first Christmas w/o her) but work has been overwhelming this week. Aww… don’t you love gentle reminders like that? Go make your mom proud! Sorry you’re without her this Christmas. I totally know how you feel. I love the blue jay feather…and the snowy owl…and…. I so love the Red Christmas Beetle pillows and mugs. just too cozy in front of the fire on a cold night. I love the red beetle with the Christmas tree and the deer with the scarf. Both adorable, but they all are… and I would have them framed. Found your sight from Inspired by Charm, I totally love Michaels taste, and follow him through my email. I don’t have Instagram or Pinterest. Thank you for this giveaway.